Two killer slices of Brazilian funk! 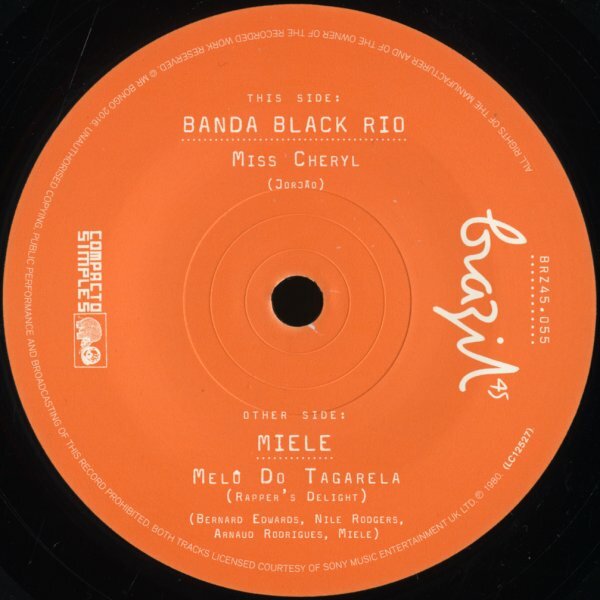 The instrumental "Miss Cheryl" is one of the trademark tunes of Banda Black Rio – a cut with these sharp, jazzy changes that are completely amazing – and which easily have BBR rivaling the sound of Earth Wind & Fire at their best! The flipside is a very cool remake of "Rapper's Delight" – one that starts out in familiar territory on the start, but then has a jazzier piano line instead of the vocal, and a wicked guitar solo in the middle! © 1996-2019, Dusty Groove, Inc.